In terms of the state and division average SOL pass rates, economically disadvantaged (“ED”) students underperform their more affluent peers (“Not ED”). For example, here are the 2018 state averages on the reading tests. This makes the SOL average an unfair tool for measuring academic progress because of the invisible disadvantage the averages place on the schools with larger populations of ED students. 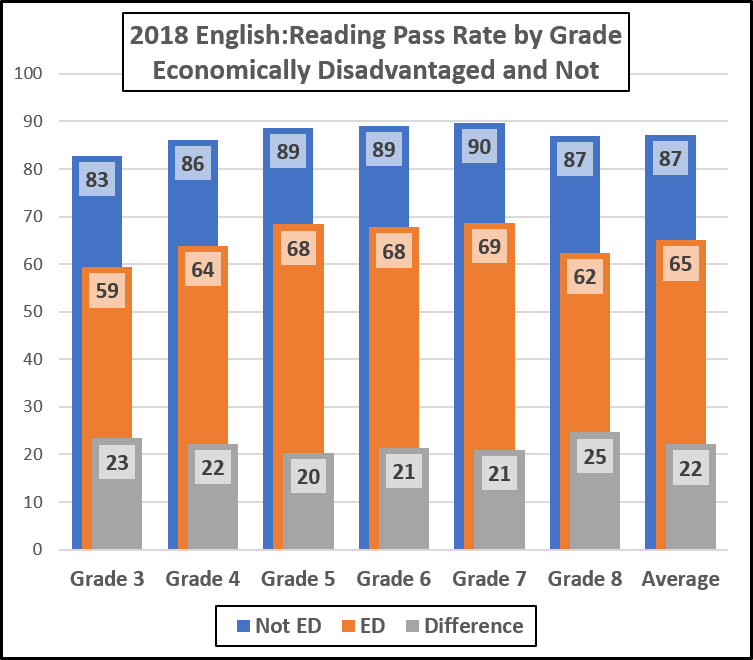 To start a dive underneath the overall averages, here are the 2018 school average reading pass rates for ED and Not ED students, plotted vs. the percentage of ED students in the school. The blue diamonds are the school averages for the students who are Not ED. The fitted line comports with the visual picture: Pass rates of the Not ED students decline as the percentage of ED students increases. The 24% R-squared value tells us that %ED predicts 24% of the variance in the pass rates. Of course, that does not say that the population of ED students causes the score change, just that the two variables are related, albeit at some distance. The orange triangles are the average pass rates of the ED students in those schools. As we would expect, those numbers mostly are lower than the Not ED rates. 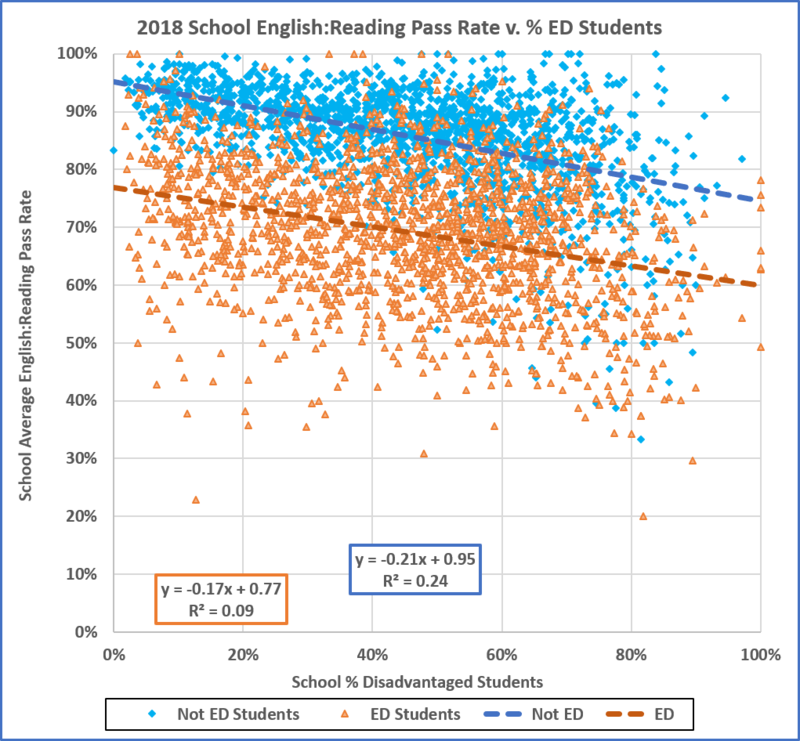 The fitted line shows a more modest negative slope and the R-squared value, 9%, tells us that the correlation between the ED pass rate and the ED percentage in the school is much less robust than the Not ED correlation. 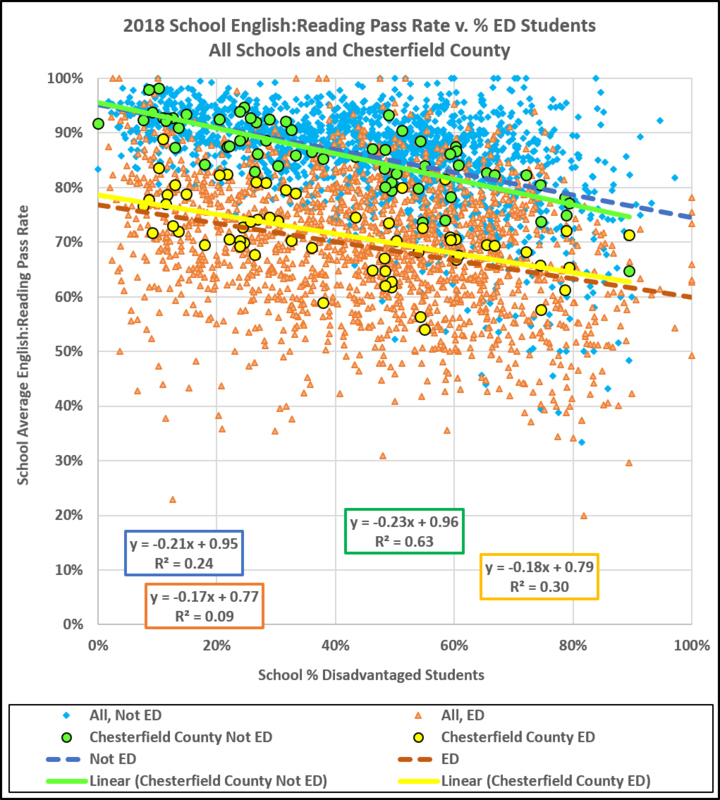 These data comport with the earlier conclusion (again without telling us the underlying factors or mechanism): At the school level, averages for ED students are generally below the averages for Not ED students. The data also suggest something else: Pass rates of the Not ED students correlate negatively, to a modest degree, with the percentage of ED students in the school. But the Not ED students, not so much. This gets even more interesting if we overlay the data for the schools in a particular division. Let’s start with the Big Guy, Fairfax. The green dots are the Fairfax Not ED school averages; yellow, the ED. The green fitted line for the Not ED students lies nearly atop the all schools line with nearly the same R-squared value. 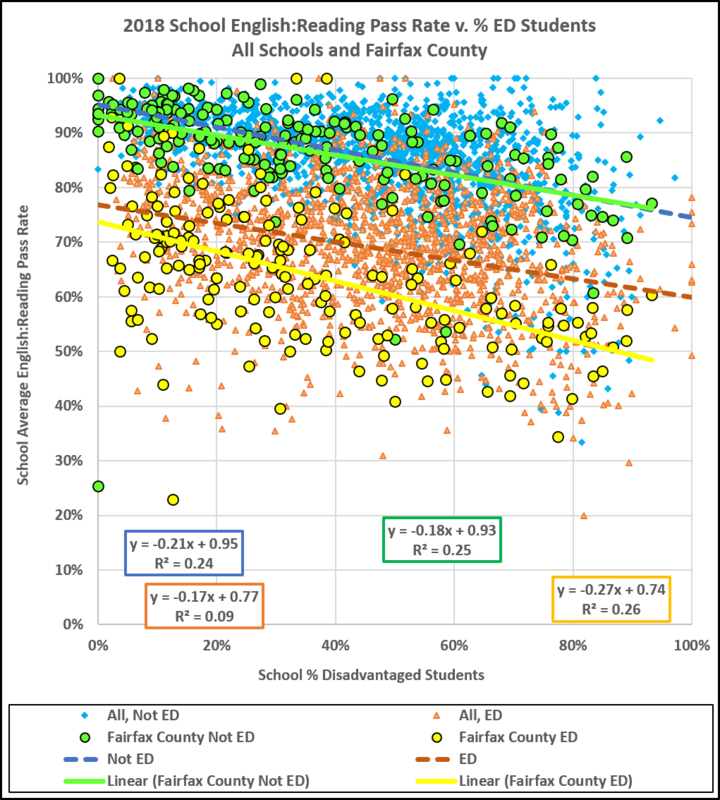 However, in terms of the school averages the Fairfax ED students underperform the state average; as well, the slope is more negative (-2.7% for a 10% increase in ED population vs. -1.8% for the Not ED students). Moreover, the R-squared values for the two groups are nearly equal and are large enough to suggest a modest correlation. Why the FFax ED students underperform and why that underperformance increases with the ED population are questions the FFax school board really should address. For sure, they have a problem there. Well, that was fun, but distant. How about Richmond? 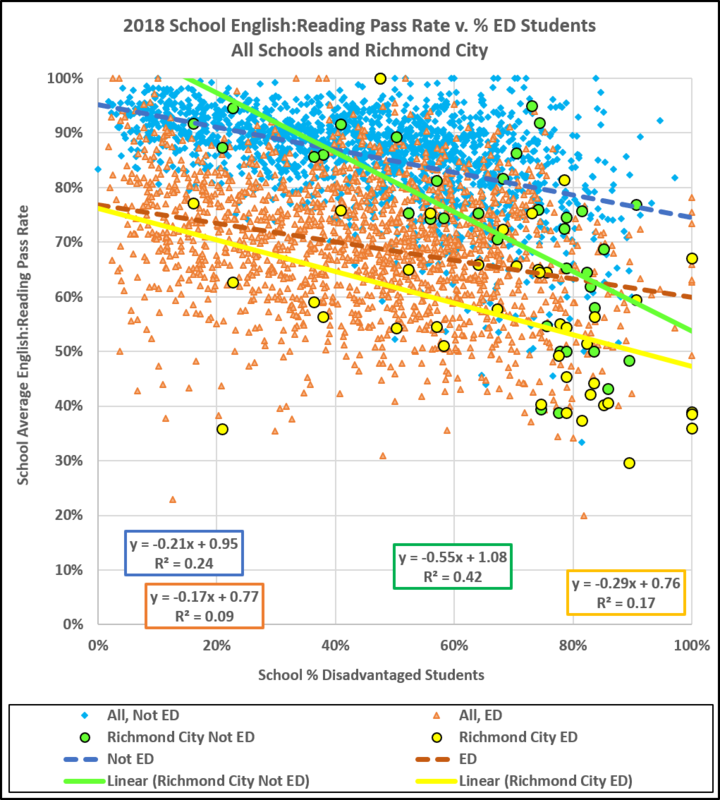 Richmond has three schools with low ED populations; the Not Ed students in those schools have OK pass rates but the ED students are a mixed bag. For the most part, both the ED and Not ED groups perform poorly in the more numerous, high-ED schools, which pulls the fitted lines down. Indeed, a 10% increase in the ED population is associated with a -5.5% change in the Not ED pass rate and -2.9% in the ED rate. As well, the R-squared for the Not ED students is reaching toward a robust correlation. 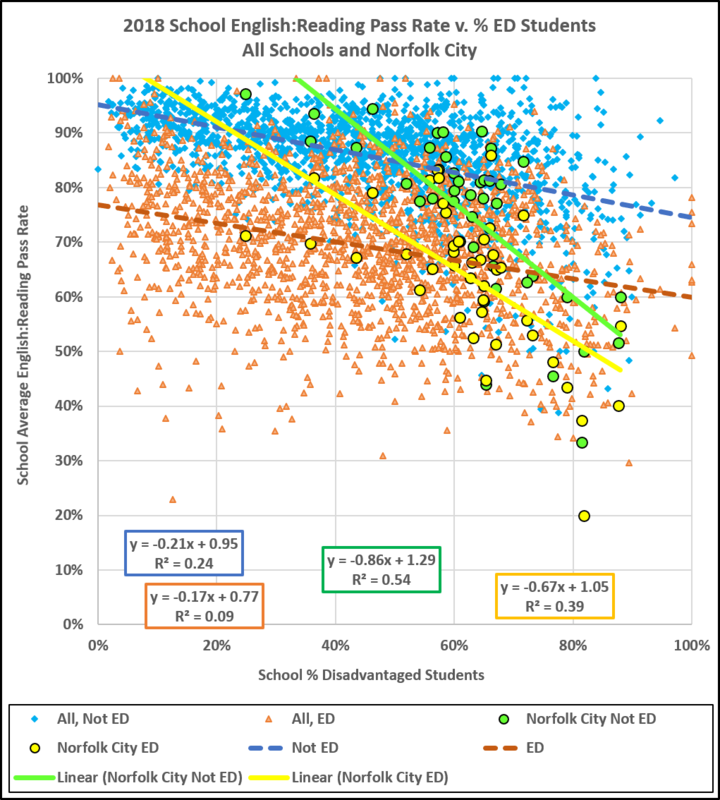 Said in English: On average, Richmond schools with more ED students have lower pass rates, while the pass rates for the Not ED students tend to be lowered more than those for the ED students. The lowest %ED school, Munford (16%), has a 92% Not ED pass rate and a better than average 77% ED rate. Richmond Alternative, at 21% ED, has a respectable 87% Not ED rate (especially “respectable” given that it is Richmond’s academic boot camp) but an awful 36% rate for its ED students. Fox, at 22% ED, has a fine Not Ed pass rate, 95%, but a subpar 63% ED rate. The yellow point at 48% ED, 100% pass rate, is Community High, a select school showing select school results. That yellow point sits atop a 100% green point. The other Richmond schools whose Not ED students averaged >90% are Franklin (95%) and Cary and TJ (92% each). The point at 89% ED shows a 29.6% ED pass rate, third worst in the state for ED students; it is the worst of our awful middle schools (and second worst overall in the state), MLK. The four yellow points at 100% ED illustrate a minor anomaly in these data: The VDOE suppression rules blocked the head counts for the Not Ed students at Greene, Fairfield Court, Southampton, and Woodville, so (1) there are no corresponding Not ED points, thus (2) those four ED points are a few % farther to the right than they should be. Count that as a bonus. If those points were in the right places, the fitted line would be even steeper. Richmond will continue to look bad at least until it figures out what is wrong here. On the SOL averages, they look even worse than their (awful) performance would merit because of the large ED populations. And, to the point of real life and not sterile numbers, Richmond’s schools are failing, miserably, in their purpose of delivering an education “to enable each student to develop the skills that are necessary for success in school, preparation for life, and reaching their full potential.” That failure is most stark in the case of the students who are already disadvantaged in economic terms. For the record, here is the Richmond list. The #DIV/0! and #N/A entries reflect suppressed data. There are more insights to be had from these data. Let’s start with the peer cities. 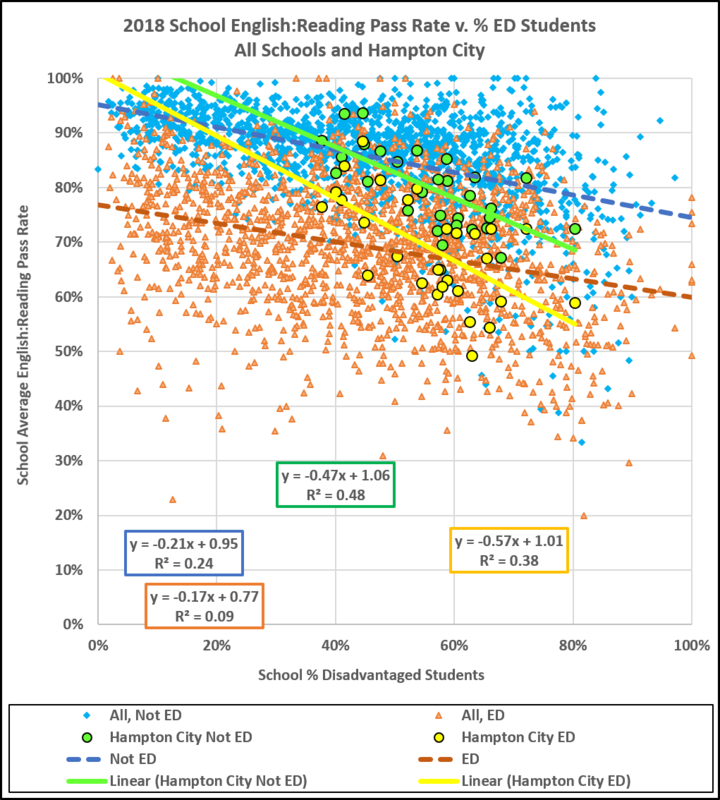 In Hampton, notice the relatively narrow range of ED percentages, the lower than average pass rates, and the steep fitted lines with non-trivial R-squared values. 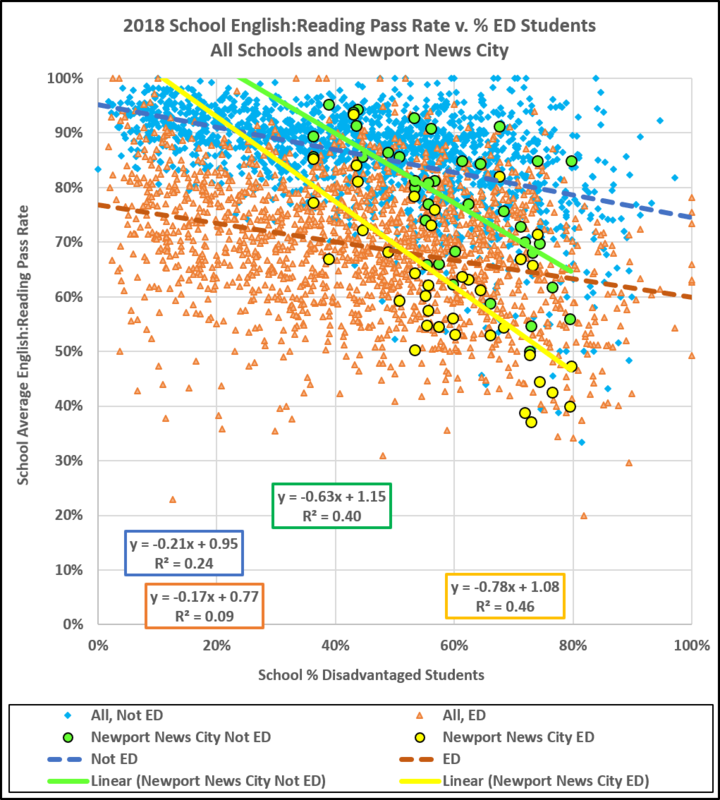 Newport News data tell the same story but with much steeper slopes and stronger correlations. Whew! That looks like a magnified version of Richmond’s ED issues. 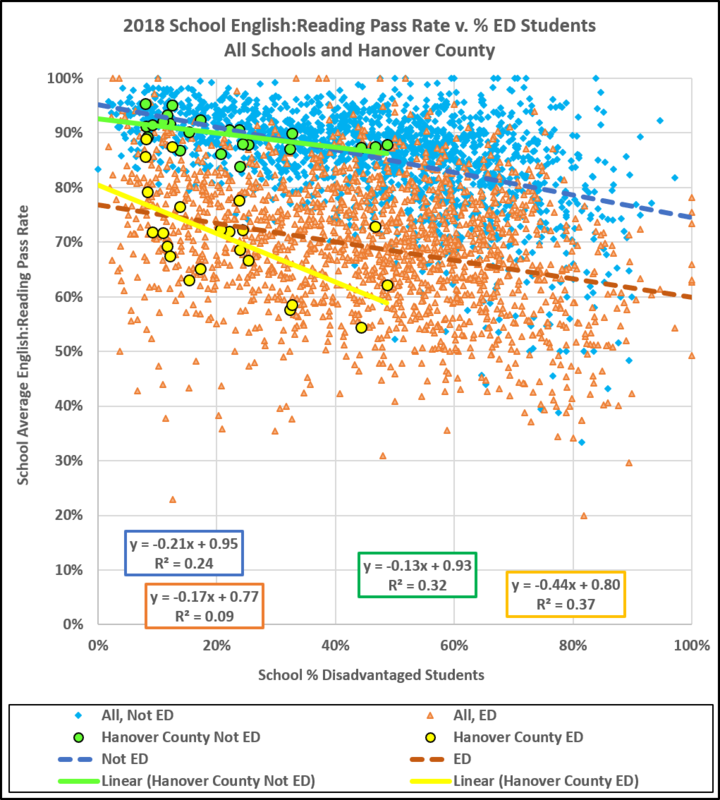 Turning to the ‘burbs, these data rat out Hanover, which performs at the state average for its Not ED students but not so well with ED students, even at the lower ED populations. Hanover gets good numbers on the statewide list of average pass rates, however, because of its low ED percentages. Then we have Chesterfield, performing at average for both groups. And Henrico, with notable correlations and major underperformance by both groups in the higher %ED schools. Finally, Lynchburg, named for a relative of my paternal grandmother and, to the point here, a place where I have a reader. Notice the milder correlations here. Also the outstanding Not ED (95%) and not so outstanding ED pass rate (59%) at the high-ED school (Dearington Elementary). Also the lowest ED pass rate, 47%, contrasting with an 83% Not ED rate (at Linkhorn Middle). Bottom line: OK Not ED pass rates in L’Burg; not so good ED.